There are so many vegetables you can regrow, that growing plants from kitchen scraps is an easy way to start a garden. You can start regrowing vegetables without spending a dime on seeds or transplants for your garden! Some vegetables need nothing more than a bit of water to get started. Others can require a bit more care and attention, but still make fun and cheap projects. Some of the easiest to grow are members of the onion family such as leeks, fennel, and green onions. After cutting the leaves for cooking simply place the white end with the roots into some water. The plant will begin regrowing from the center, pushing up new green stems in about a week. You can leave it in water, refreshing weekly and using and reusing the new growth or you can plant it out into the garden. I started a leek this way a couple summers ago and it grew happily in my garden up until this fall when it went to seed. I have some of the seeds saved for this spring and already there are some self-seeded baby leeks in the garden. Regrowing lettuce on the stem is also started this way. Carrot tops and pineapple are probably the best known plants that will grow. They make fun house plants but they don’t produce any edibles. Cut the tops off and place in water and they will grow. Avocado pits are another popular plant to start. You can grow these by using toothpicks to suspend half the pit in water. Once it grows roots you can pot it in soil and it makes a handsome house plant. One summer my best friend gave me an avocado she had started. She was such a pro at them that she had a tiny jungle on her back porch! Root vegetables will also grow from scraps. I have had volunteer potatoes show up in my compost bin from scraps and I’ve saved potatoes for planting. Cut it into pieces, making sure each piece has a mm eye or two the plant into trenches. Here are more details on how to plant potatoes. Sweet potatoes regrow when the vines or the root of sweet potato plants are placed in water. You’ll need to get an organic variety that hasn’t been treated to prevent sprouting. The two times I tried with conventional grocery store types the potato molded before it ever sprouted. Grow Garlic from the cloves you buy at the store. You can even plant it into a pot for indoor harvesting. Here are more details about growing garlic. Ginger is another root that is eager to grow. Plant it directly into the soil in a sunny and warm place. It makes a good house plant as well. It does like to be warm, so if it’s not growing outdoors for you it may be too cold. Here are more details about growing ginger. Many herbs will root from cuttings such as basil, rosemary, lavender, lemon balm, oregano, sage, thyme, marjoram, and mints. They can be started in just water but you may have better results using willow water. Willow has a great deal of rooting hormone in it, especially in the shoots of new growth. You can chop up the tips of willow branches, cover with water and allow them to soak for a couple of nights. Then strain the water and use it for starting your cuttings. Permaculture News has more details about making willow water. If you want to learn more about using herbs, check out the Hebarium from The Herbal Academy. For more ideas on herbs and other fruits and plants that can be grown from cuttings, check out 15 Reliable and Edible Plants For the Forgetful Gardener. Plants that are started from seeds include pantry staples such as beans, lentils, and garbanzo beans. Lentils make an airy little stem, very delicate and pretty. I’ve even harvested more seeds from garbanzo beans I’ve planted from the store. Plant beans and lentils one inch deep and five to six inches apart in a sunny spot for the best growth. You can even grow pomegranates from the seeds! Wipe off the flesh and juice, then plant immediately into soil and they will sprout and grow. 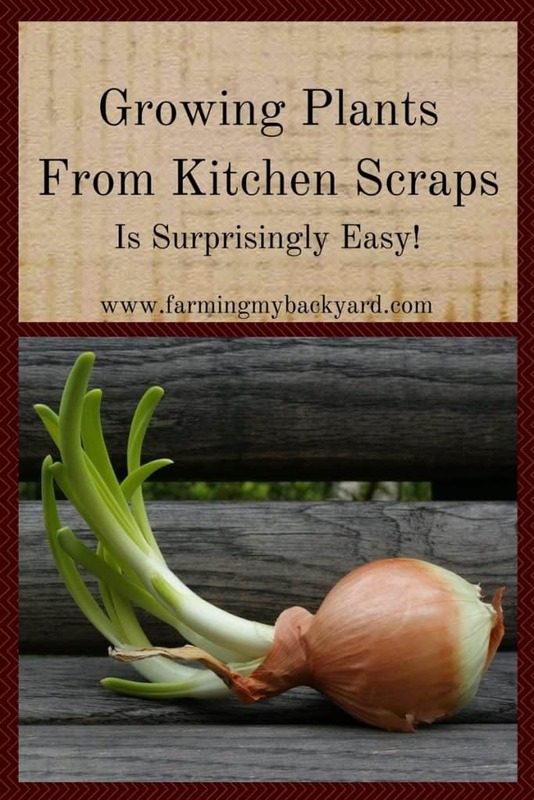 Start Growing Plants From Kitchen Scraps! Growing plants from kitchen scraps is a fun and frugal way to increase the number of plants you can grow each season. I especially like to have a few carrot tops and green onions sprouting in the kitchen in the winter to keep me busy before it’s time to order the seeds. What plants do you like to regrow? Share in the comments below! Pineapples grown from the tops of pineapples will produce edibles! We’ve been growing them for 5 years now. It takes 2-3 years for the plant to fruit. Awesome! I keep meaning to try sweet potatoes.